Diamonds are among natures most precious and beautiful creations. 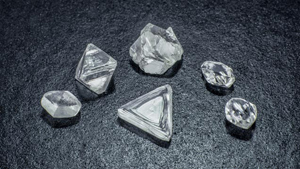 Diamond forms under high temperature and pressure conditions that exist only about 100 miles beneath the earths surface. Diamonds carbon atoms are bonded in essentially the same way in all directions. Another mineral, graphite, also contains only carbon, but its formation process and crystal structure are very different. Graphite is so soft that you can write with it, while diamond is so hard that you can only scratch it with another diamond. On almost all modern birthstone lists, diamond is recognized today as the birthstone for April. Diamond is also the gem that marks the 60th and 75th wedding anniversaries. The average yield in most diamond mines is 1 part diamond to 1 million parts host rock. Diamonds are the hardest material on earth: 58 times harder than anything else in nature. Fifty light years from earth, this star is a 10 billion-trillion-trillion carat diamond. The human contribution to a diamonds beauty is a well-executed cut. Cut (proportions, symmetry, and polish) is a measure of how a diamonds facets interact with light.